Jeremy Corbyn is a man who has dedicated his entire life to fighting racism and injustice — he is not a racist and therefore clearly he is not anti-Semitic. He has not once denied the Holocaust and therefore he is not a Holocaust-denier. It seems, however, that none of this matters to those who would bring him down. Zionist groups within the Labour Party, which include LFI (Labour Friends of Israel) and the JLM (the Zionist ‘Jewish Labour Movement’), skillfully utilize the pro-Zionist media. They are trying — and failing — to paint Jeremy Corbyn as an anti-Semite. However, the problem is not anti-Semitism but Corbyn’s stance on Palestine. These Zionist groups want to get rid of Corbyn because of his principled stance on Palestine, Israeli colonialism and occupation of Palestine, and they use anti-Semitism labels because they think it will work. The desperation of those seeking to oust Corbyn can be seen by the latest accusation against him: attending a memorial for terrorists. It was given impetus by a remark by the Israeli prime minister, in what is a shocking intervention by Israel in British politics. Benjamin Netanyahu made remarks about the Labour leader, saying that he deserves “unequivocal condemnation.” In what can only be described as an escalation of the already heavy-handed intervention of Zionist groups to end Jeremy Corbyn’s leadership, Netanyahu said that Corbyn’s participation in a ceremony at a cemetery in Tunis in 2014 is deserving of condemnation, because — according to Netanyahu — terrorists are buried there. Corbyn did not remain silent. True to himself once again, he struck back, reminding Netanyahu that what is deserving of condemnation is Israeli forces’ killing of hundreds of protesters in Gaza and the passing of the new, racist Israel Nation State Law. Netanyahu — along with what may well be the loudest Zionist mouthpiece in Britain, The Daily Mail — claims that Corbyn was present at a ceremony and even laid a wreath on the graves of terrorists connected with the 1972 attack on the Israeli athletes during the Munich Olympic games. The truth of the matter is that the event in which Corbyn participated had nothing to do with the Munich attack. In 2014 Jeremy Corbyn attended a service at a cemetery in Tunis commemorating the victims of the 1985 Israeli airstrike on the Palestinian Liberation Organisation (PLO) offices in Tunis. This Israeli attack was a breach of international law, violated the sovereignty of another country, and received worldwide condemnation, including by the United States. Furthermore, none of the eight men who participated in the Munich attack are buried in Tunis. The four men who are buried there — and whose tombstones are shown in The Daily Mail photo — are Salah Khalaf, who was Yasser Arafat’s deputy; his aide, Fakhri al-Omari; Hayel Abdel-Hamid, who was the PLO chief of security; and Atef Bseiso. Bseiso was assassinated in Paris in 1992 — 20 years after the Munich Olympics. He was heavily involved in talks with the CIA in an attempt to advance relations between the U.S. and the PLO. Israel claimed that all four were involved in the attack in Munich and had all of them assassinated either directly or by the proxy terror group, Abu-Nidal. There was never a shred of proof, not to mention a trial, to substantiate Israel’s allegations against these men. The big question is why does the Israeli prime minister feel he needs to engage in such blatant intervention and and make such blatantly false accusations just as Britain’s largest political party is about to convene? Netanyahu and his henchmen must realize that U.K. Labour, having gained over half a million members since Jeremy Corbyn’s ascent as leader, is poised to win in the next elections, so that, if Israel fails to oust him, Jeremy Corbyn will end up in 10 Downing Street. One of the ridiculous charges laid against Corbyn is the following: He was criticized for attending a passover Seder with a particular group of Jewish people who “dismissed concerns about anti-Semitism in the party.” So it is not good enough that he went to a Seder and that he opted to do so among people who live in his own constituency; he had to do so with Jewish people who think a particular way. 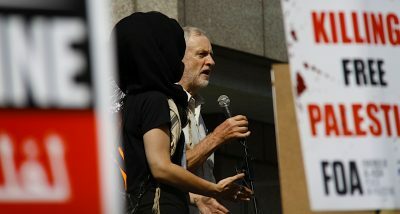 Corbyn was also criticized for participating in an event with the late Hajo Meyer, a Jewish holocaust survivor himself. This was in 2010, when Corbyn hosted a Holocaust Memorial Day event in London with Meyer as the main speaker. Hajo Meyer was, like many holocaust survivors, a fervent advocate for Palestinian rights and a severe critic of Israel — hence the criticism. Another example, in which I was personally involved, has to do with a comment that I made at a fringe event during the 2017 Labour conference and that turned into a major news item. During a panel on free speech, I said that free speech means we should be able to discuss every issue, including Palestine and the Holocaust. The Daily Mail published this as though it was a scandalous thing to say and accused Labour and even Corbyn himself for allowing it to happen. Every other newspaper in Britain followed suit and then papers in Palestine and even the Israeli papers picked it up as well. I added in my remarks that, while free speech should not be criminalized, we do not need to give a platform to proponents of any racist ideology, and that includes Zionists who regularly demand to be present and give their perspective at events and lectures. My presence during the conference and my comments did not warrant such attention. However, this is a war of attrition in which Labour Friends of Israel, the so-called ‘Jewish Labour Movement, and the British Daily Mail are leading the charge and will jump at every opportunity to get attention. Once again, the problem was not denial of the Holocaust or anti-Semitism — because there was no expression of either one — but the fear of a discussion on Palestine and Zionism. By trying to silence the discussion regarding Zionism and its legitimacy, Israel abuses the memory of the millions who died in the Holocaust, particularly the Jewish victims. There are entire communities of Jewish Holocaust survivors and descendants of survivors who are quite ready to discuss and debate any issue, including the Holocaust, and who view the Zionists’ stance as absurd. These same Jewish communities also reject Zionism and support the Palestinian call for BDS, or Boycott Divestment and Sanctions against Israel. It is time that these voices be heard. In other words, there is nothing he can say or do to “clear” himself. They are determined to oust him and they think the anti-Semitic card will do the trick.